I made to Japan safely and I am having a wonderful time in spite of the ground rumbly here and there. There was an 6-7 magnitude earthquake in Fukuoka on Sunday morning. It was there first major quake in about 108 years. We were heading to Fukuoka and Sasebo that day but decided to stay in Osaka for another night. We got to Fukuoka Monday afternoon and roamed around a bit before heading home to Sasebo. This has been the experience of a lifetime and I cannot thank K. and his family enough for making the trip extra special. Osaka and Fukuoka remind me of smaller versions of New York City. Kyoto is breaktaking with all the temples and old world charm. It has been rainy here in Sasebo today so I have not had a chance to venture out yet. I will definitely do so before I journey back to Osaka to catch my flight home on Thursday. As far as the food, I have not ventured out too far yet but I did have some octopus the other day that was quite tasty. There are vending machines at every turn so there is never a want for your favorite beverage or pack of smokes. There are tons of electronic gadgets to buy but I am being good. I picked up a new MD player that I really love. The next generation of MD’s have cameras built into them. I can’t say that I totally get the logic of that but they do look slick. Speaking of cameras, my new digital camera is getting quite the workout. I have almost filled up a 512MB memory card which translates to over 700 photos. If you click on the photo above, it will take you to a few photos from my current adventures. I will share more after I get back to the states and get some sleep. Until next time, kiotsukete kudasai! This entry was posted on Monday, March 21st, 2005 at 11:03 pm. It is filed under Special Feature. You can follow any responses to this entry through the RSS 2.0 feed. I’m glad you and K. are all right, and how cute are you in this photo! So cute. Tell us about the music you’ve heard in Japan! I’m so relieved you’re okay. Whew! Cute pic. I ventured to Tokyo last year. I had a blast. 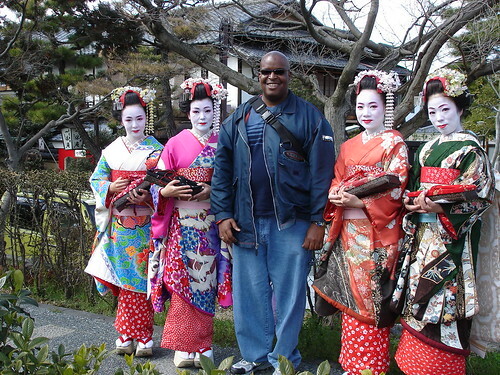 Do your thang black man… have a great time! glad you made it safely, it’s looks beautiful in japan. I am so glad you are ok. heard about the earthquake and was worried. Can’t wait to hear stories and see pics. Ahhhh… the pleasures of a Western toilet! Wow!!! What a great photo. You look wonderful. I hope you’re having an excellent time. Oh how wonderful. hee, hee, hee, she giggles covering her mouth like a trained geisha. What a dork I am.